Exit #4, turn right at the end of the bridge, go straight down the road by the brooklet, enter the south gate to Boramae Park, pass the fountain pond, go straight through the road to the west gate of the Park, go out of the Park and then turn left at the corner. You can see 8stories building named KMA. 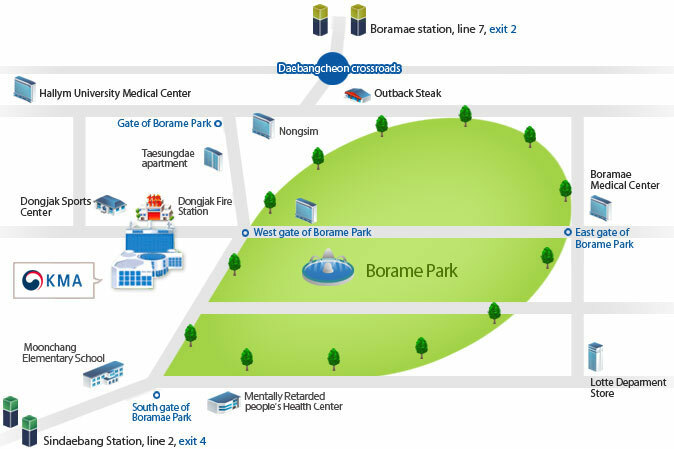 Exit #2, go straight for about 3 blocks, turn left to the entrance road, go up the road to the west gate of Boramae Park and then see 8stories building on the right at the west gate. Take the subway line #5 toward downtown, transfer to line #2 at Yeongdeungpo-gu Office station and then take off at Sindaebang station on exit #4 (see By subway 1). Take a Limousine Bus for Yeongdeungpo, get off at Yeongdeungpo, then take subway line #1 toward Incheon or Suwon, transfer to line #2 at Sindorim station toward Gangnam and then take off at Sindaebang station on exit #4 (see By subway 1).